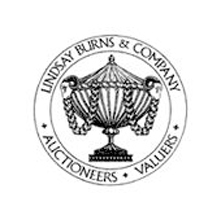 Lindsay Burns & Company is a family run form of Auctioneers and Valuers with over 50 years of knowledge, expertise and experience in handling the sale of Antiques, Fine Art, Collectables and General Chattels. Founded in 1982 by Lindsay and Elspeth Burns the company is now owned and run by their son Nick and his wife Claire Burns. Our saleroom and offices are located at 6 King Street in the City of Perth. Our premises, a former Church, date to the second quarter of the 19th century and are ideally suited to exhibiting items, with a large open floor space and secure display cabinets. There is an on-site car park adjacent to the building which makes the consignment and collection of goods simple and convenient. In an ever changing market place we have developed our auctions with the use of state of the art technology allowing us to present lots to the widest possible audience whilst retaining the traditional values of auctioneering. Our own transport is available for the uplift of goods whether it is a single item, house clearance or entire estate. A regular calendar of auctions allows the flexibility to offer items for sale in both Specialist sales of Antiques and Fine Art as well as General sales. Lindsay Burns & Company is unique in that we undertake all the aspects of valuation, removal, auction sale, clearance and administration without the involvement of any third party, an approach that proves to be popular with existing clients.